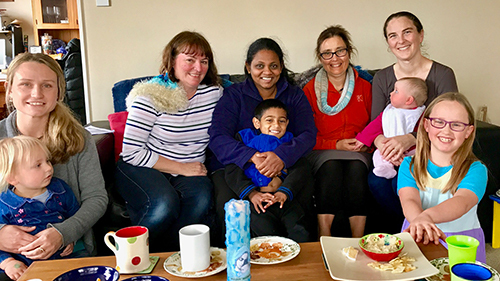 Marian Mothers is a network of and for women who want to come together for prayer, mutual encouragement, support and faith reflection usually in their own homes. It began in 1981 and have since spread the length and breadth of New Zealand facilitated by Marist Laity NZ. Groups offer friendship, mutual support, fun and a safe environment to explore life and spirituality issues for mothers and women of all ages. Mary’s role as mother of Jesus and therefore mother of God and mother of the church is central to salvation and as Marists we support and nurture the faith and spirituality of mothers; when a mother is supported, a family is supported. I like to contemplate the holiness present in the patience of God’s people: in those parents who raise their children with immense love, in those men and women who work hard to support their families. In their daily perseverance I see the holiness of the Church militant. Are you married? Be holy by loving and caring for your husband or wife, as Christ does for the Church. Do you work for a living? Be holy by labouring with integrity and skill in the service of your brothers and sisters. Are you a parent or grandparent? Be holy by patiently teaching the little ones how to follow Jesus. (Para 14). In 1995 Pope John Paul II said in his letter to women. If you are interested in starting a Marian Mothers group or would like to be put in contact with your nearest group, please contact them by email and include your town and country. Groups within New Zealand receive a CD, with reflection topics for each month from February to November, accompanying leaflets to guide a meeting and a monthly newsletter. The only preparation needed is the facility to play a CD. Everything else is provided and simple to use in a variety of ways that work for your group. Overseas groups can receive the full material by post (P&P is required) or by an email link to the website without the CD. There are opportunities for New Zealand retreats and reflection days in your area facilitated by Marist Laity NZ. Bev McDonald and Vanessa Ornelas are happy to help the groups with resources, ideas and visits on request.